Join Kayakasia for exciting kayak adventures in our Southern shores! 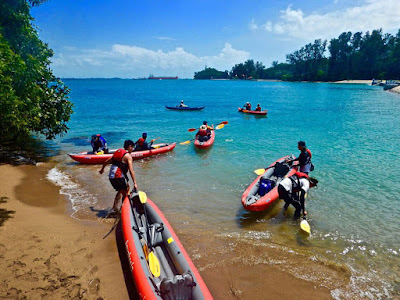 They plan to paddle to Sentosa Island, Tekukor Island, Seringat Island, Kusu Island, Pink Lagoon, Lazarus Island, St John's Island, Sisters' Islands. Join us for a sea kayaking paddle to our southern islands using sea kayaks! Whether we paddle together for fitness, leisure, or friends, it is going to be a swell time on the waters! Provided: Single sea kayak (close deck) @ $95 per person, inclusive paddle, pfd, sprayskirt, & bilge pump. Where are we paddling to? *Paddling route subject to changes depending on weather, water, and group conditions.